The CEO (Chief Engineering Officer) started design and construction with Atlas 3 Rail Pratt Truss Bridges and designed 2 deluxe access bridges for the SSPRR Run Room. 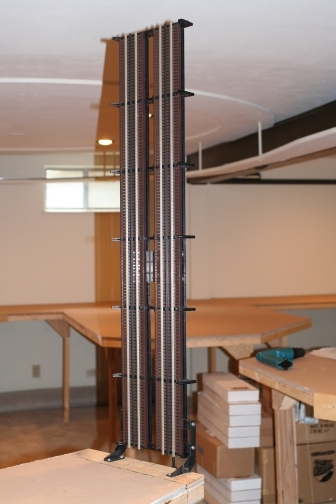 The single track bridge super structure is used on the Run Room Ceiling Track Crossover. The maintenance department has neglected to install the safety cable railing for the single track bridge. Thanks to the Run Room CEO, bridge performance has been exceptional for years. 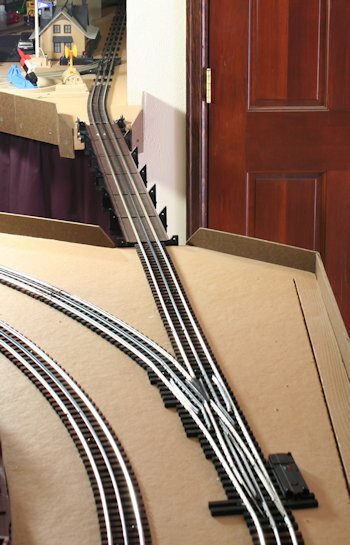 The only improvement that could be made is to secure the track rails so they don't slip back and forth (could be secured with pins or glue). Gas springs hold the bridges up. 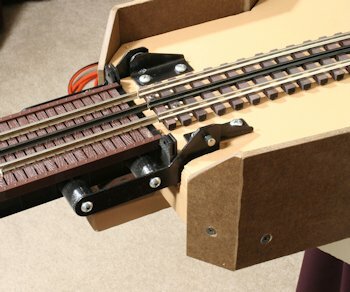 The custom hinges and spring hardware increase the stability of the bridges. 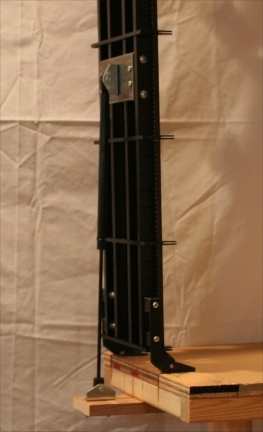 The added hardware is attached to the existing Atlas steel straps inside the girder slots. Click on photos to see the bridge locations in the Run Room. Construction photos and drawings are posted for your use. Engine safety electrical circuits prevent an Ooops. This Lionel 671 is diving into the hole where the bridge is open. See Engine Safety Relays for protection at the Atlas lift bridges. See Access Bridges used as Switches for more circuits. the stranded wires from the table. Atlas 3-Rail Two Track Pratt Truss Bridge with Lift Assist installed before tables are finished and track is laid. The gas spring starts holding the bridge about half way to all the way up. 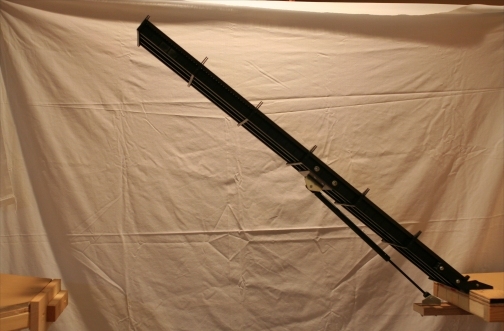 prevent collision with the Ceiling Track structure. Questions? Please use to send an email. Copyright © 2018 S. Deats. All Rights Reserved.